(Available for download as OA on Frontiers – just click through the link) via Dissociation of dorsal hippocampal regi… [Front Behav Neurosci. 2011] – PubMed – NCBI. Passecker J, Hok V, Della-Chiesa A, Chah E, O’Mara SM. Trinity College Institute of Neuroscience, Trinity College Dublin Dublin, Republic of Ireland. Stress has deleterious effects on brain, body, and behavior in humans and animals alike. The present work investigated how 30-min acute photic stress exposure impacts on spatial information processing in the main sub-regions of the dorsal hippocampal formation [CA1, CA3, and dentate gyrus (DG)], a brain structure prominently implicated in memory and spatial representation. Recordings were performed from spatially tuned hippocampal and DG cells in rats while animals foraged in a square arena for food. 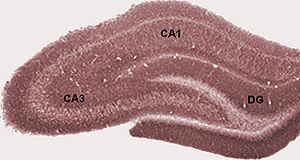 The stress procedure induced a decrease in firing frequencies in CA1 and CA3 place cells while sparing locational characteristics. In contrast to the CA1-CA3 network, acute stress failed to induce major changes in the DG neuronal population. These data demonstrate a clear dissociation of the effects of stress on the main hippocampal sub-regions. Our findings further support the notion of decreased hippocampal excitability arising from behavioral stress in areas CA1 and CA3, but not in DG. via Dissociation of dorsal hippocampal regi… [Front Behav Neurosci. 2011] – PubMed – NCBI.